I love the beach. Seriously, my dream home would be a beach house where I could look out at the water every single day and take a walk in the sand every single night. So when families ask me to join them at the beach for a portrait session, the answer is always, "Yes! See you at sunset!" I had so much fun with Robyn, Pete, and their birthday boy Nicholas during our session together at Pleasant Road Beach in Harwich. This beach is close to their home, and one that Pete spent his summers at growing up. 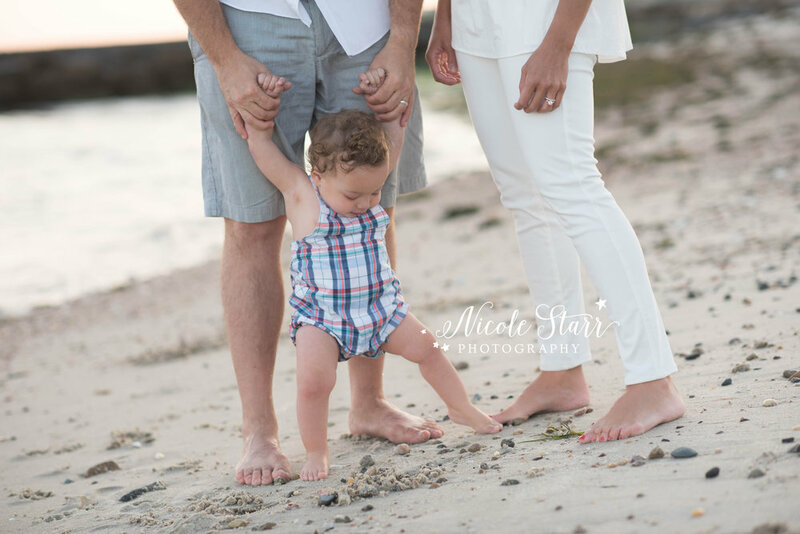 The rocks on the jetty, the shingled houses behind the tall seagrass -- they all mean so much more when they have a story to them, and it made for the perfect backdrop for this family's session. Plus, it was a nice little piece of saltwater heaven that they introduced me to for the first time, and a new favorite spot on the Cape! Isn't this little plaid romper just perfect for our session? I love the styling on this session, and everyone's outfits came together perfectly for some modern family photos at the beach. In addition to family photos of everyone playing together, I love to capture a few quiet moments with mom & dad alone with the baby. These sweet little cuddles are always some of my favorite moments to capture!